Kyler Castilleja (#20) is shown scoring a touchdown as he jumps over a PSJA North player. 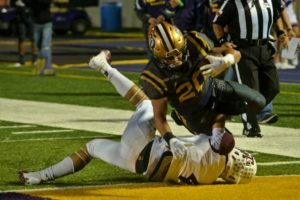 Sophomore Greyhound Running Back Kyler Castilleja has had a remarkable school year, boasting a host of awards and impressive statistics. As a team, the Greyhounds went 4-1 in district, won the Battle of the Arroyo, Bi-district championship, Area Championship, and were regional qualifiers. Kyler himself was awarded 32-6A Newcomer of the Year, 32-6A 2nd Team Special Teams (Returner), and Greyhound Offensive Back of the Year. Kyler averaged 1126 yards total offense (7.5 yards per touch), 14 TD’s (12 rushing & 2 receiving), 3 two-point conversions, and zero fumbles on over 150 touches.